It's been 44 years since the first ever issue of the Rangers News hit the newsagents. The opening editorial described it as, "a newspaper about the Club – for the supporters. Not just those who follow the team every week or those turn out only occasionally, but for the many fans scattered over Scotland, England and overseas, who can only keep in touch with Rangers F.C. through T.V. or the national press." 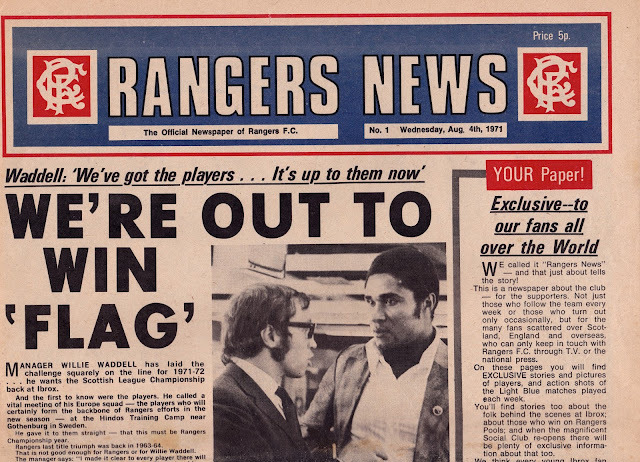 Sadly, the Rangers News/Monthly as it was ceased to exist in recent times, and with new mediums being embraced by the Club it's doubtful we'll ever see a modern equivalent any time. My copy of the 1st Edition has seen better days, however I've unwrapped it, scanned all the pages in and uploaded them in good quality in order that you can read the articles and look at the great photographs taken more than a few generations ago.